The Curator is a bit of a dark horse because it is a relatively new category, birthed at a historical moment when all roles and definitions of players in art were in flux. The much-discussed death of the author essentially cleared some space for new authorities to step in, and from this a new profession—not necessarily an artist, or a gallerist, or a writer, but a curator—emerged. By the nature and conditions of its origin, the definition and function of the curator is unstable. One thing that seems fairly constant, however, is that the curator’s main function is to organize art exhibitions around a theme or concept. It makes sense. Like normcore, essayistic curating is a notion that’s being bandied about more frequently, and, unlike normcore, it’s actually an interesting idea. Whether it signals a shift in the discipline or is just a modish diversion, the essayistic approach does appear to be gaining conceptual traction as an alternative to more traditional thematic exhibitions. A recent interview in Art Review brought together two of the leading proponents of the essayistic approach, Anselm Franke and Dieter Roelstraete. The two curators challenged the popular assumption or assertion that exhibitions need to be about something. Roelstraete described the thematic exhibition as too “self-assured… too monolithic, too confident in the solidity of its ‘theme’” (“Resistance to Communication Is Crucia, Art Review, 66.3, April 2014: 91). In contrast they propose essayistic curating as more open and accumulative – less authoritative and more dialogical or exploratory. They imply that an essayistic exhibition would function more as a laboratory of sorts, a testing ground for ideas and experiments. Franke refers to the need to question and deconstruct assumed subject-object relations and Roelstraete (in a trick employed by academics everywhere to lend linguistic weight to an argument), points to the etymological root of “essay” in the French verb essayer, meaning to try, to test, to guess or to speculate. Then, there’s the question of the uncurated exhibition. We were recently invited to a show of eight graduating MFA students from Concordia who rather than exhibiting in university or local commercial galleries, had mounted a group show at a rented offsite location. The artists – all working in different styles, on different subjects, and having little more in common than being friends and colleagues – hung the show themselves without a pre-established curatorial vision, primarily conforming to practical and intuitively aesthetic concerns. Keeping with the DIY program, they self-published an accompanying catalogue (designed by Emily Jan with Jacquelyn Hébert) for which Tammer El-Sheikh, art historian and visiting scholar in Concordia’s Fine Arts Department, contributed an essay. It sounded like an impressive endeavour, but of course we were a little wary that the show itself might lack any sense of cohesion. 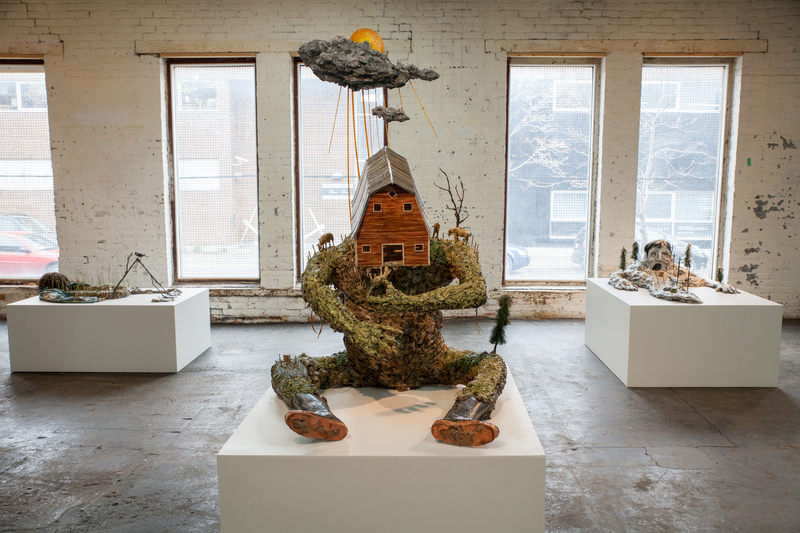 Especially as even the title – OK OK OK: An MFA Thesis Exhibition – was devoid of any particular information. It’s a catchy title, though, as risky as it is benign: if the show wasn’t any good—if it was just OK for instance—it would be ripe for satire and naked to the barrage of OK puns we were already brainstorming. But, in the end, from the quality of the works on display, their (mostly) adept organization within the impeccably lit – itself, gorgeous – space, and the impressive publication accompanying the show, we really had no choice but just to accept the title’s affirmative tone: Everything was A-OK, OK, OK. In fact, it was better than just OK (OK, OK). 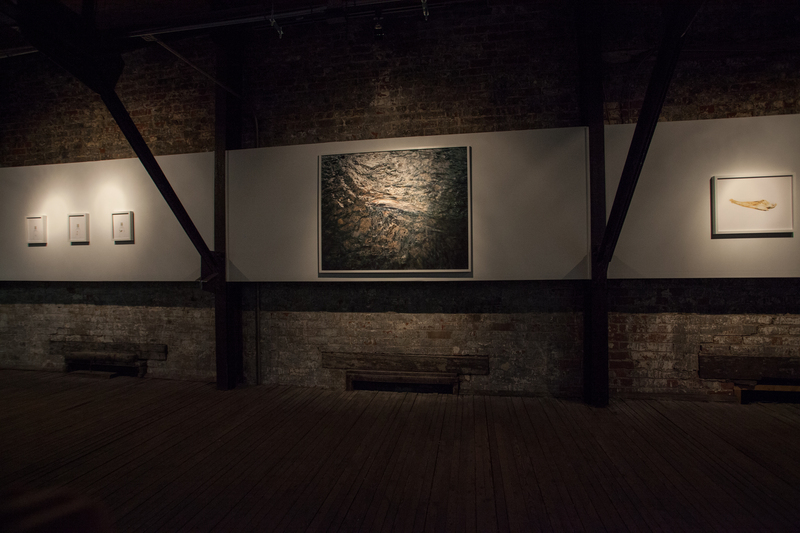 Les Ateliers Jean Brillant is a beautiful exhibition space attached to its namesake’s metalwork studio in St. Henri. The building has a bit of a split personality, with a more traditional white-walled and bright gallery-style front room, serving as the entrance to a cavernous wood and brick interior that feels like what the pre-condo industrial building must have been. A location this distinct and remarkable needs to be taken into account, rather than overcome and in the case of OK OK OK it’s almost as if the space itself had a hand in curating the show. Clever choices clearly had to be made as to what works would occupy each room and, for the most part, these choices seemed to us unquestionably correct, so that the artworks and their environment appear to be working in cahoots. The contrast between the two rooms was most apparent during the exhibition’s evening vernissage, without the natural daylight spilling into the back room through its high windows and skylights. Traversing the threshold between the two rooms felt like transitioning from day into night. This was partly the lighting and partly the fact that the bar was in the back, but still. That first room housed the more plastic arts. 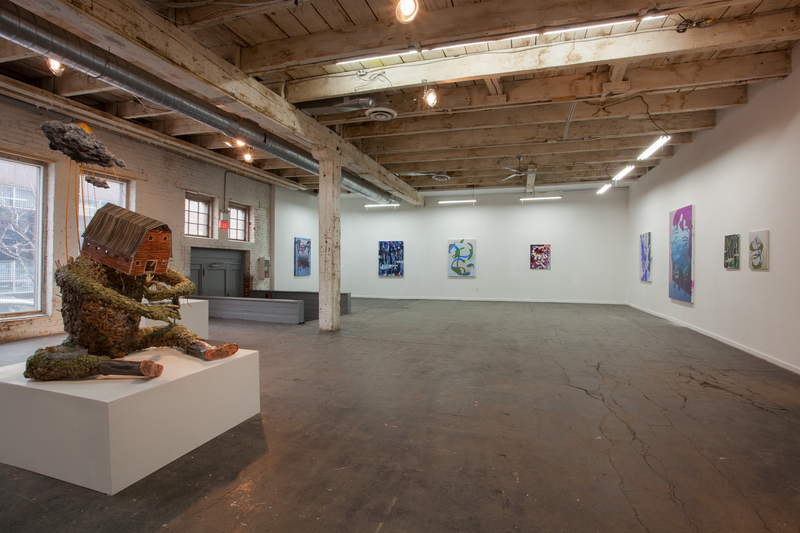 One half was shared between the painters Nathaniel Hurtubise and Brendan Flanagan, the latter also having a small collection of sculptures dispersed around the space. 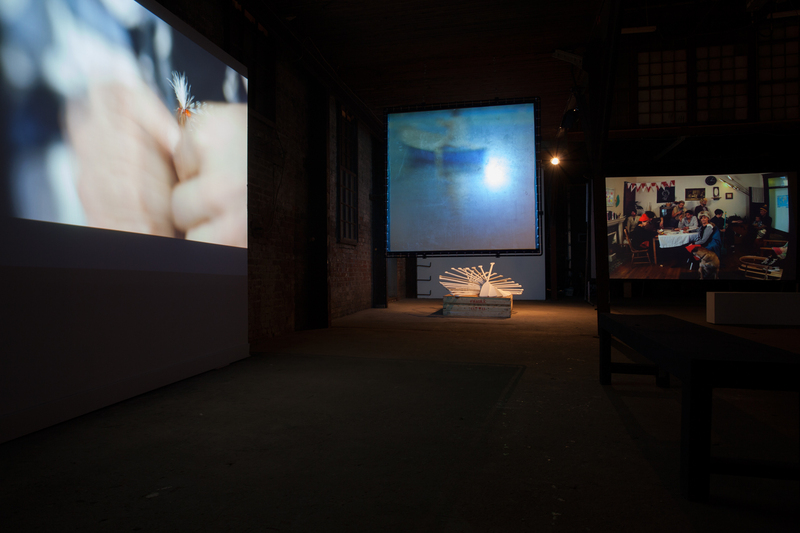 There’s a natural interplay between the two artists’ work – an abstract vocabulary that lends volume or distance to the two-dimensional canvas through the use of either quotidian or more high-tech materials: Hurtubise’s recycling of used tape and other studio discards, and Flanagan’s laser cutting and in-situ shadow-play. The organization of these works became a rather confusing aspect of the show, however, as they seemed to be consistently reorganized throughout the duration of the exhibition, sometimes being all of Flanagan’s or Hurtubise’s or a mixture of the two. It was a logistical confusion that was exacerbated by a lack of clear labeling so that it wasn’t always clear whose work belonged to whom. On the other side of the room, a series of Tammy Salzl’s small watercolour portraits were paired with Jude Griebel’s papier-mâché sculptures. The coupling of these two artists’ works was perfect: both are enigmatic, emotionally inflected, dripping with stories to tell and sort of soupy in appearance. Salzl’s “zombified” portraits (the artist’s term) of family, friends and acquaintances seem to register her sitters’ psyches as much as their physical appearances. The colours and lines appear to vibrate on the paper as if constantly shifting to keep up with their subjects. Similarly, Griebel’s creatures – Frankensteins built out of human parts mashed up with landscapes and infrastructure – are like embodiments or personified renderings of psychological states. They’re like super-complex, humorous and touching three-dimensional Mr. Men. But, gone are Hargreaves’ overly simplified Mr. Happy or Little Miss Bossy of picture-book fame. Here we are confronted with character types that resonate more with adult life. Little Miss Helpful, meet Ms. Anxiety; Mr. Clumsy, make way for Accident Mouth. His creatures are, at once, funny and dreary, executed with wry wit and compassion. In papier-mâché and watercolour, respectively, Griebel and Salzl prove themselves masters of their crafts and, equally, observers of the human condition. After such intimate consideration of the works in the front gallery, crossing into the barn-like back room was almost overwhelming. As mentioned before, the space itself was commanding, and the works installed throughout appeared to be of more monumental size and scope. The smallest work in the room was given so much space that even it almost seemed large. A single small screen displayed Stéphane Calce’s Distinction sans difference, a 30 minute 35 mm film transferred to digital and accompanied by a revolving overhead speaker that El-Sheikh accurately describes as “creepy and enveloping.” The work itself is like a spectral and melancholic essay on the history and changing state of filmic media. It’s a graduate thesis, expertly conceived and completed. Also reaching backwards and forwards throughout art history is probably the most visually arresting piece in the show: Emily Jan’s installation After the Hunt. A sprawling banquet table, groaning with a maximal riot of real and fake flowers and foodstuffs – platters and platters of plastic fruit, semi-peeled lemons with wrinkled rinds, half-drunk goblets of wine and steins of beer – lit candles with their dripping wax and a series of expertly crafted, completely fabricated “taxidermied animals.” The crown of the work is a felted deer, its belly split open and its tongue hanging out of its mouth, strung up by a hind leg to one of the overhanging beams above. 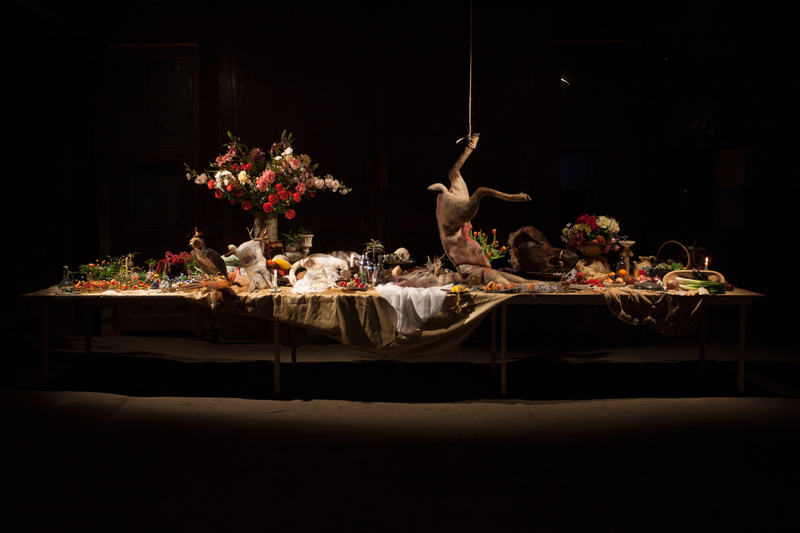 It’s an incredible installation – an homage and interrogation of Frans Snijders’ 17th century painting Game Still Life with a Red Deer, and the historical genre in general – a potent statement on glut, greed and decadence, both historically and contemporarily. Its commentary was only enhanced by a subsequent visit to the exhibition, when the candles had melted down, the un-drunk booze had grown mould and a number of flies buzzed around the table landing undiscerningly on rotting fruit and untarnished plastic – feasting on the leg of woollen deer carcass. Jan clearly found the perfect location for this installation – it was as if it were made for the space. Across the expanse, Jacquelyn Hébert’s large-screen video work French Canadian Habitants Playing at Cards (After Cornelius Kreighoff, 1848), faced Jan’s installation: tableau vivant and tableau mort locked in each other’s gaze. Hébert’s video is like a living photograph, carefully staged to mimic Krieghoff’s historic lithograph. The pairing with Jan’s installation is strong and the works share much: an art historical precedent; compositional and referential abundance; and a comment on or communication with the historical and continuing processes of exploration, colonization and collecting. Hébert has a collection of other works on display as well – each relating to the multiplicity of identities interplayed and appropriated in well-worn signifiers of Canadiana. A second video depicts the filmic rendering of a dream the artist had in which she was trying to paddle a canoe, but her oars kept disintegrating in the water. A dream of helplessness, anxiety and insecurity, the struggle to keep going when it all just seems impossible: a grad student’s dream if ever we’d heard one. Hébert’s film is displayed on a double-sided hanging screen and paired with an installation of paper-made oars, like those in her dream. However, its placement – despite looking great – causes some complication by its proximity to the work of another artist. It hangs adjacent to Blair Phllip’s film, Follow the Line, and we were under the false impression on our first visit that the two screens were components of a single work. Certainly there’s easy – perhaps too obvious – interplay between the two films, each picturing waterways and the view form a boat, but they’re drastically different works and their alignment is ultimately only superficial. Phillip’s film is a beautiful rumination on the art and practice of fly-fishing, as well as (fittingly for this exhibition) on the student-mentor relationship, the diligence of absolute immersion in an activity or an ideology, and ultimately on pleasure and perseverance in general. It’s composed of three sections and is an entirely different experience with and without the aid of the headphones hanging nearby. The first third is taken from the perspective of, presumably, the artist on a boat, filming the river on which he travels and various fishermen on the shore. There’s an almost narrative quality to the sound of the waves – an orchestral lapping and rushing and splicing of the water by the boat. It cuts eventually to a YouTube video of fly-fishing cult icon Fran Betters instructing viewers on how to make a particular fly (the AuSable Wulff). He’s an endearing character with quick and agile hands and a folksy way of anthropomorphizing his flies. But, of course, fisherman’s flies are basically the very definition of anthropomorphism: they’re handcrafted stand-ins meant to attract the attention and desire of real fish. It’s what El-Sheikh describes beautifully in his catalogue essay as the insect mimesis central to the fly-fisherman’s technique. The final third of Phillip’s film depicts the artist mimicking Betters’ craft, but lacking the speed or accuracy of his mentor – we watch his hands shake in certain moments under the pressure of precision and listen to his concentrated breathing in the place of Betters’ confident instructions. Combined with the artist’s striking photographs of his bottled flies and an unhooked fish laying in the riverbed, as well as his self-published book project (which, El-Sheikh notes, functions to insert the artist into the centuries-spanning literary tradition that accompanies the practice of fly-fishing) there’s a sense in which Phillip’s work is archetypal for the entire exhibition. Lacking any pre-conceived theme or curatorial vision, the single undeniable commonality of the artists included in the exhibition is their position as graduating students completing years of study, apprenticeship and experimentation. Phillip’s work beatifies and describes this experience by metaphor, association and poetics. His work refers to an artistic and literal history (like Jan and Hébert), as well as to the evolution of art over time and across media (like Calce, Flanagan and Hurtubise), and taps into the confluence of character and craftsmanship (as exhibited in by Griebel and Salzl). There are other links and parallels to be drawn between the works on display in OK OK OK, and El-Sheikh does a fantastic job of attending to these in his catalogue essay. It was after visiting the exhibition and reading El-Sheikh’s piece that we were struck by that question of essayistic versus thematic curating. While having an essay describe a non-thematic show is certainly not what proponents of the approach like Franke or Roelstraete would determine “essayistic,” in this case, it does seem to fit. The space certainly functioned like a kind of laboratory in which hypotheses were born out of the alignment and interaction of the works within the space. And El-Sheikh’s ability to draw or develop currents across the show attends to the success of the experiment. If we’re to consider the exhibition an essay, then it can be read in multiple ways. The best essays are not conclusive, but are the progenitors of further discourse. This entry was posted in Uncategorized and tagged Blair Phllip, Brendan Flanagan, Concordia Fine Arts, Contemporary art, curators, Emily Jan, essayistic curating, Jacquelyn Hébert, Jude Griebel, Les Ateliers Jean Brillant, Nathaniel Hurtubise, Stéphane Calce, Tammer El-Sheikh, Tammy Salzl. Bookmark the permalink.